I hope you all had a wonderful weekend! We had an amazing Easter weekend, followed by a much more relaxing day at home with the entire family. 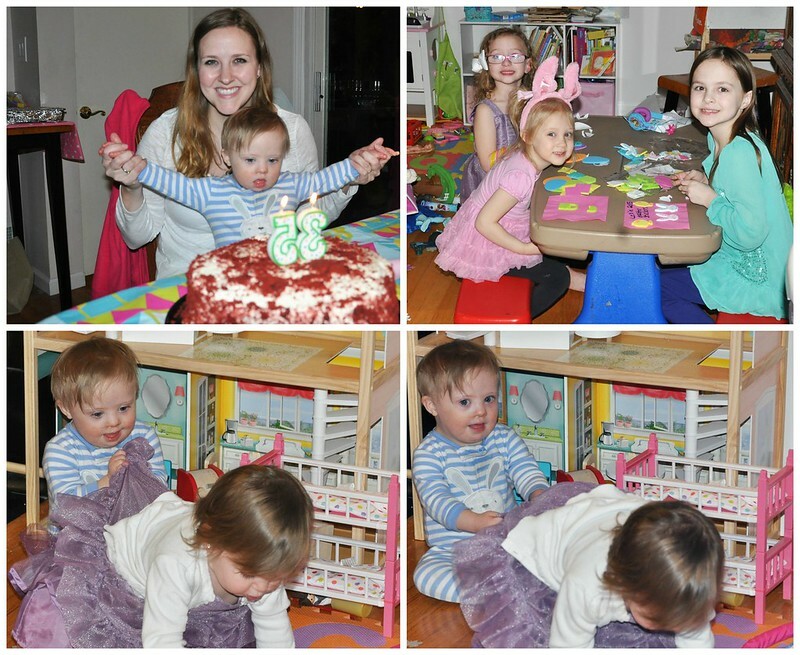 I'm still recovering from our whirlwind weekend! In a few hours, my husband will return to work, the big kids will return to school, and Liam has therapy. Back to normal! On Saturday, we were on the go from the moment we woke up until the moment we got home at 12:15 AM! 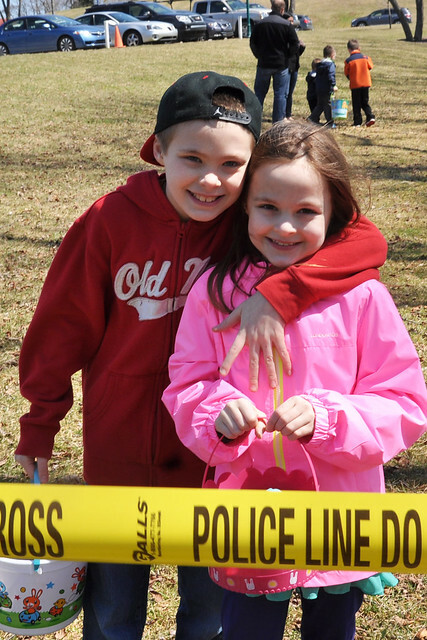 First on our agenda was an egg hunt at a local park. We went the past few years with friends, but this year I was on my own with all 4 kids. I strapped Liam in the Ergo, and hoped for the best! Because of their age gap, Dylan and Lexie were at a separate field from Lily. I had to stay with Lily, so I didn't get to see Dylan and Lexie. 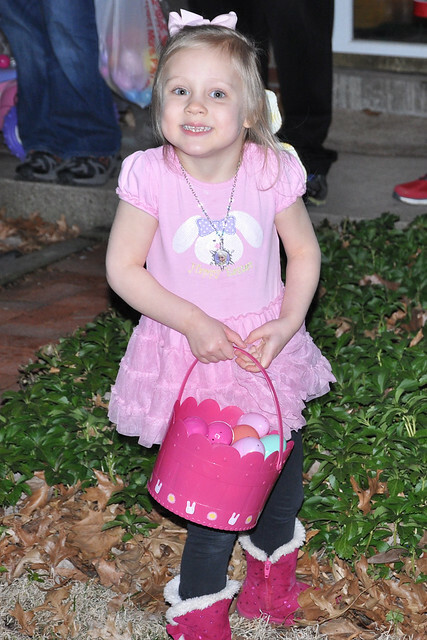 Lily's egg hunt was just as insane as it was last year. The 5 and under crowd is fierce. 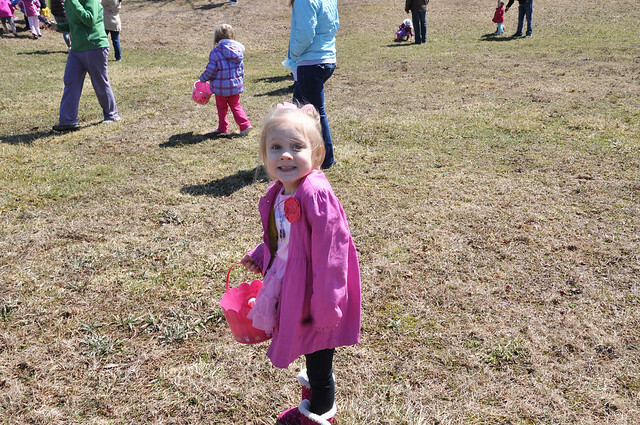 Lily ran for a few eggs, but after nearly getting knocked down by some older kids and some over-eager parents (I wish I was kidding), she decided those few eggs were plenty! 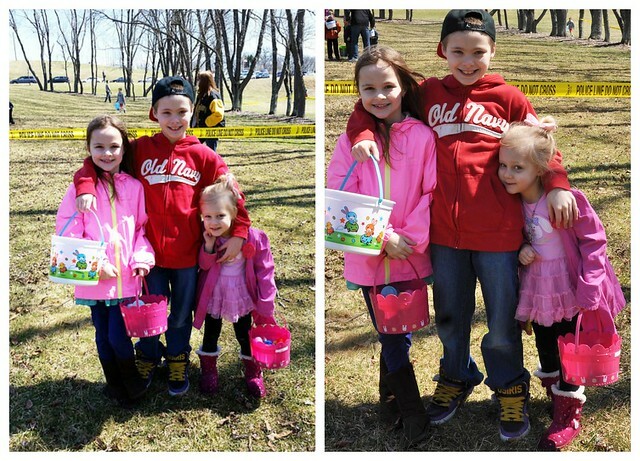 We were able to see the very end of Dylan and Lexie's egg hunt and met them at the edge of the field. 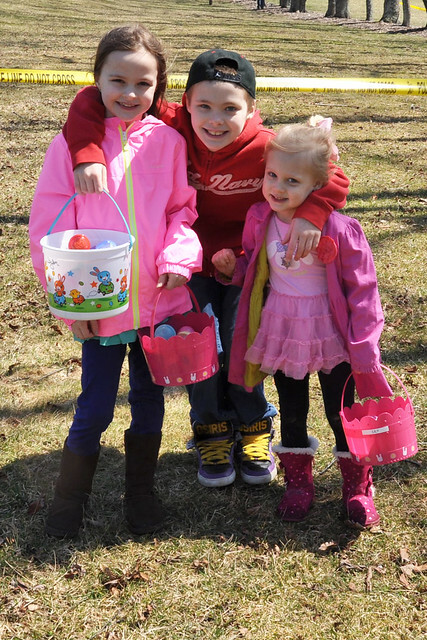 They got tons of eggs, mainly because there were less kids in the older group! The entire thing was over in 1 minute! 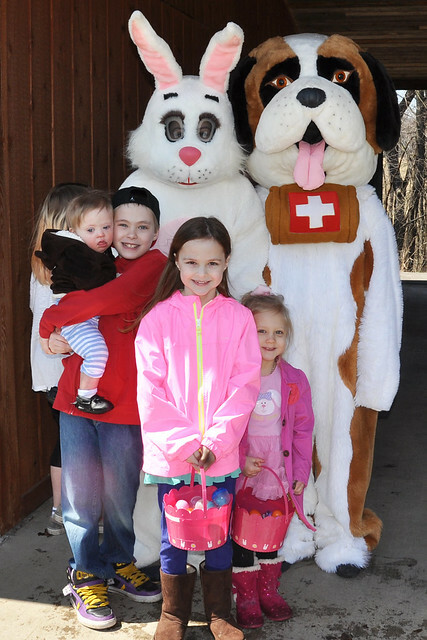 The kids got their goody bags, and got in line to see the bunny. Other than not being able to take many pictures, it was painless. 15 minutes after arriving, we were back in our car! Our next stop was at Target for a birthday gift for Dylan's friend, followed by a quick trip to Kohl's for an Easter dress for me. Once home, we only had a few minutes to gather our things for the rest of our day, then we hopped back in the car. Dylan went to a birthday party at a carpet skate park, while the rest of us went to my friend Steph's house. She was hosting our annual Easter Dinner and Egg Hunt for friends, and generously offered to let us come early since we were so close. Grant left to pick Dylan up, just as the rest of our friends started to arrive. 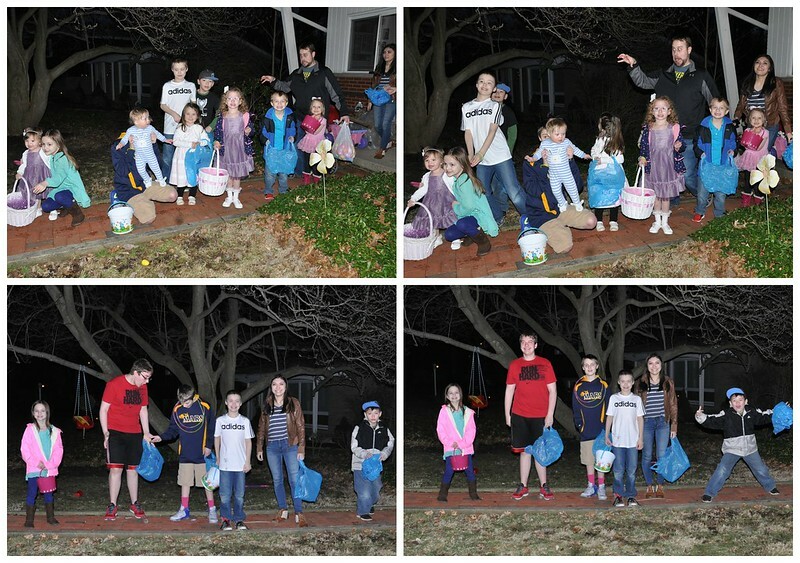 We had a delicious Easter dinner, followed by an egg hunt at dusk for little kids, and a glow in the dark egg hunt at night for the older kids! Liam was the only kid who didn't enjoy it. He was cold and tired, and not too thrilled about the idea! Liam cheered up as soon as we went back inside! 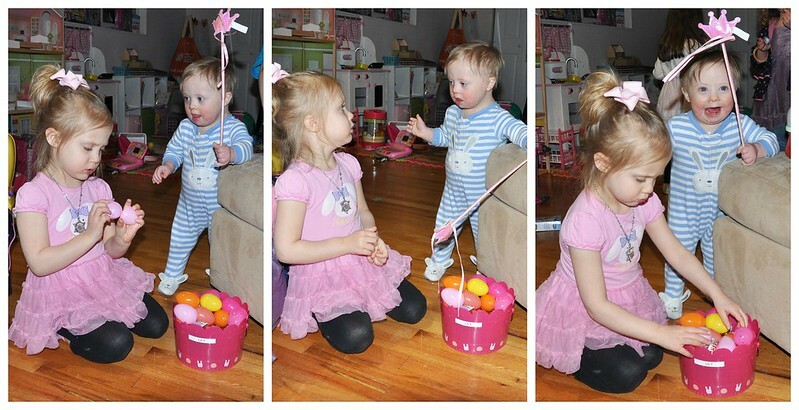 Of course, he was plotting how to hit his big sister in the head with a princess wand. He succeeded. We spent the rest of the evening having fun with our friends. They even celebrated my birthday with a delicious red velvet cake. It was such a special night with our "framily" whom we love dearly! We usually don't have our Easter party with our friends the day before Easter, but due to busy schedules and other events, we didn't have much of a choice. It was nice, though. 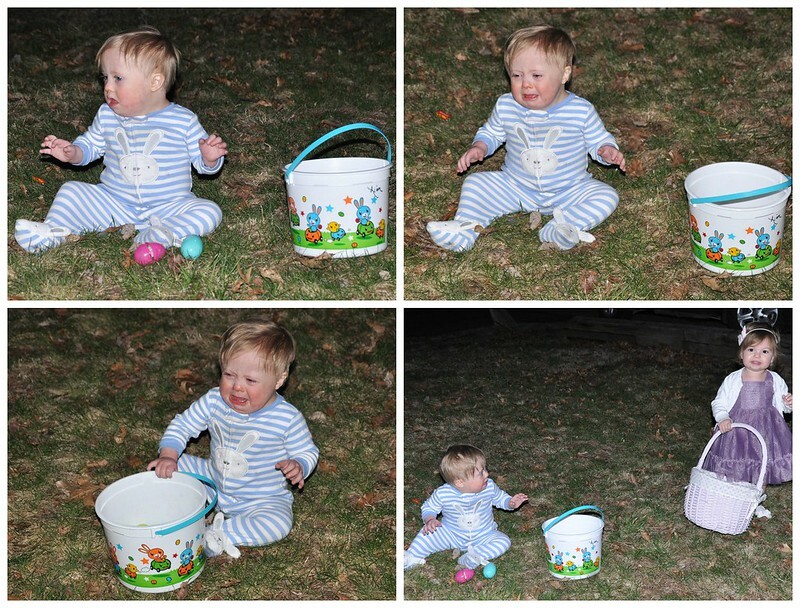 It felt like we celebrated Easter the entire weekend! It was a bummer having to say goodbye so early (before midnight is early for us! ), but we had another busy day ahead of us. All the kids fell asleep on the way home, and Grant and I talked about how good the day was despite being so busy. We arrived home just after midnight, and thanks to our sleeping kids, bedtime was a breeze! I headed to bed with a full heart and so much excitement for Easter Sunday! 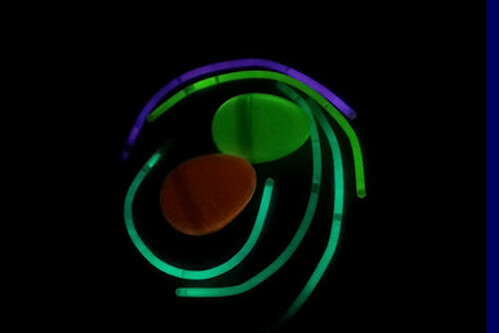 The kids loved the glow in the dark eggs. We started that a year or two ago! I agree...I love sad baby pictures, too! Whew you guys had a full day! I totally agree the 5 and under crowd is INSANE. So many eggs gone in seconds. That cake looks so good. Man I feel cake deprived. It was busy, but so much fun! 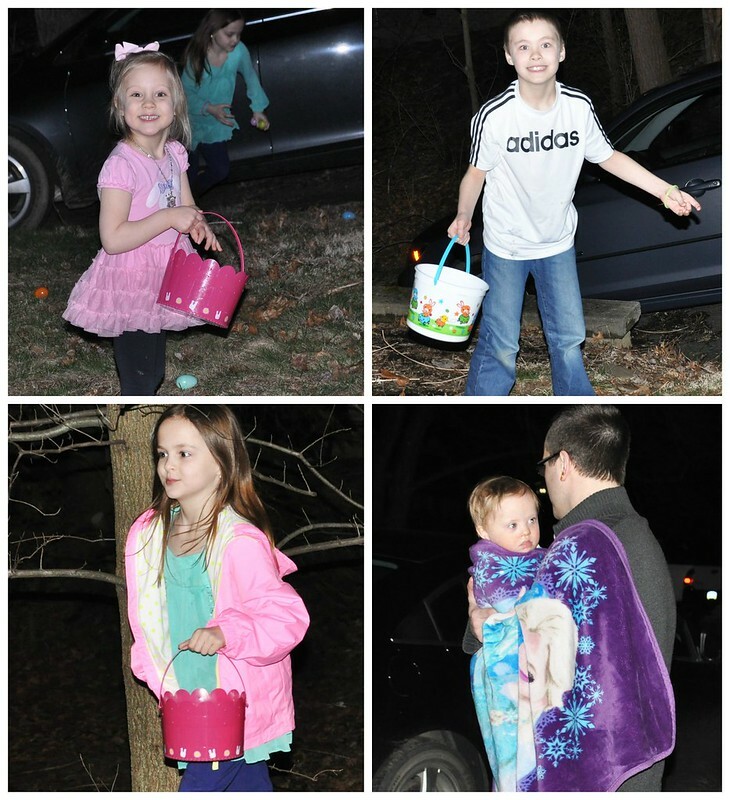 The egg hunt was CRAZY. I'm glad Lily was a good sport! I can't deprive myself of cake. Haha!!! Thanks! We had a great day! Those easter PJs!!!! Too Cute!